Staten Island is at it again. This time they are targeting mice as a means of mitigating the tick problem – instead of targeting deer. Recall that Staten Island contracted with Cornell University to undertake a deer vasectomy program that is believed to stop or reduce the breeding and production of deer by making sure some of the male deer are unable to mate with a female deer in heat. There’s a couple of problems with this dog and pony show. One problem is that one buck, that has not been snipped and clipped, will probably die trying to breed all the female deer that come into heat. The second problem is that when a doe deer goes into estrus (heat) she will remain that way until bred. Somewhere alone the lines in the misguided, perverse society we are subjected to, I read something about deer reproductive rights. Now, some say due to an overblown deer population on the island, the threat of disease from ticks is growing as well. But this time, instead of going after the deer to curb the diseases, New York will spend a gob of money each year for 3 years to go after mice – the real culprits that spread the deer tick responsible for Lyme disease. Deer meat tastes far better than mouse meat. Because we live in a post normal world, where everything is upside-down, our sick culture cannot see the benefits of killing the deer to eat, which in turn would help to mitigate the tick problem AND at the same time, seriously reduce the number of nasty, disease-carrying mice. Better health, better food. Earlier I wrote about Maine’s plan to subcontract out a portion of their black bear management plan. In that article I made the comment: “…why is the MDIFW willing to compromise their track record for their work over the years with black bears? I can only see one or two scenarios playing out here. One, if MDIFW doesn’t have the tools to do the job, maybe it’s time to ask why we have a Department of Inland Fisheries and Wildlife? Why not privatize the whole mess of departments? Have social demands gotten so big (because MDIFW decided to make management decisions based on social demands rather than science.) real science is replaced by socialistic Romance Biology? And then it donned on me. Recently the Maine Department of Inland Fisheries and Wildlife (MDIFW) took a similar tactic when they wasted (in my opinion) money hiring a scientismistic private entity to conduct a “survey” to help MDIFW decide how they should do their jobs. It has always puzzled me that MDIFW refuses to open their ears and communicate with the boots-on-the-ground outdoors people but are eager and willing to hire some environmentalist-trained, biased company to tell them how to manage wildlife and outdoor recreation when said company knows squat about Maine or the people in it. We have seen results of this corrupt environmentalist, Human Interaction, “survey” in the recent big game management plans. I think MDIFW seeking “outside” assistance is just another nail in the coffin to go along with the fraudulent management plans that apparently the department is incapable of crafting or too scared to do without laying the blame and responsibility on the results of the survey, i.e. some outside private business for profit entity. When you combine the actions of MDIFW leadership over the past 2 or 3 years, I am left with no other explanation as to why Maine, once thought of as the leader in wildlife management, also once a leader in big game hunting and world class fishing, is so eager to do a double-flush of the toilet making sure all that was once good is now gone. When nothing changes with the bear management plans and reaching the goals crafted in the new plan is a failure, MDIFW can conveniently blame whoever or whatever it is that told them what they ought to do. MDIFW has had multiple recommendations pushed in front of them concerning bear management. It’s laughable that MDIFW will buckle and cave to the demands of environmentalists and guides, refusing to do anything constructive to reduce the bear population out of fear of reprisals from guides, environmentalists, and animal rights groups, while shutting their ears and eyes to the real sportsmen. And then, we see this act of seeking an outside opinion. You can’t make this stuff up. Because MDIFW refuses to do what’s right, they are slaves to guides, outfitters and the environmental movement. 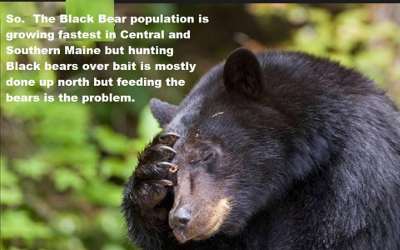 The result, they claim, is they can’t find (wink-wink) a solution to the supposed bear problem. What will we hear next? MDIFW has decided to award their bear management subcontract to a subsidiary of the Humane Society of the United States based in China?